ABC blocks, hardwood beads, colorful wooden rings, slats of wood and plastic chain, with a 4" diameter whiffle ball center, all strung on a nickel plated welded chain, topped with a nickel plated quick link for easy hanging and a large bell on the bottom for a ringing good time. Photographed with sun conures using it at a perch, this toy is sized for most smaller to medium sized parrots and especially loved by our Congo African Grey, Noah! 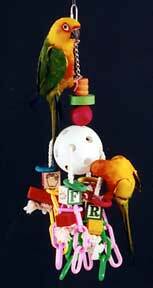 If your feathered companion tends to be mechanical, please remove the clapper before giving to your avian family!